A year ago, I took my solo flight out to Detroit. It was New Years Eve and I was so excited to go. I made the trip for one reason: to roadtrip from Detroit out to Portland, Oregon with two friends that were moving out there. It was amazing, and a once in a lifetime experience I think. We may have just booked it across the country - making the trip from Grand Rapids, Michigan to Portland in less than 48 hours - but it was beautiful. I had never seen any of the US farther west than Buffalo, New York before this. I encourage anyone who has never crossed the country like this to do so. You won't regret it. This post is entirely composed of cell phone and instant photographs. I don't care that they are not high quality. They are so meaningful and capture my trip perfectly. So have a look. The abandoned houses in Detroit are like none other. I am so in love with Wyoming. This was my first time seeing Mount Hood and even from a distance it is absolutely beautiful. 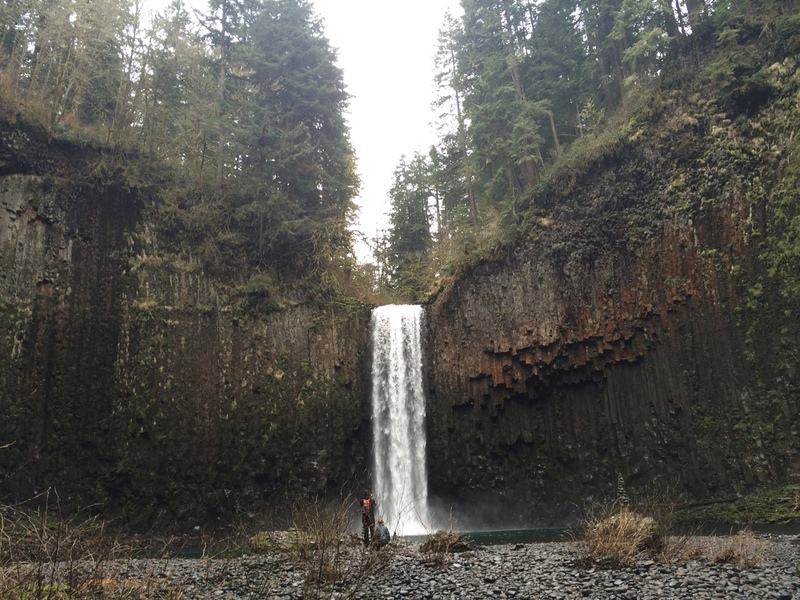 This waterfall may be incredibly popular and overphotographed, but theres a reason for that. Its breathtaking. My legs killed while walking the path, but the greenery was beautiful. No trip to Portland is complete without stopping by Voodoo Donuts. So worth it. I will never forget nights like this. Rob and I ran across a five lane road to see this view of the city. Exhilarating and wonderful. The trip we took to Hug Point and Cannon Beach was my first time really seeing the Pacific Ocean. When I went to Vancouver last year for Flickr Island, it was the Pacific waters, sure, but not the open ocean. So I loved this trip we got to take, so much. I miss it like crazy. This is my very favorite ice cream. Honey Lavender ice cream from Salt & Straw in Portland. The best I've ever had. So the day is finally here for me to graduate and its weird. I mean, four years of college, after I was forced to transfer from one to another because my original school closed... although sometimes I think that ending up at a different school was the best thing that could have happened to me. If I had stayed at Chester College, there would have been two photography majors in my year. At the New Hampshire Institute of Art, we ended with over 20. My own little family of creatives. I wish I had gotten to know them better; most of them I didn't meet until junior year, a whole year after my transfer, but oh well. I still made some great friends. I have never been much of a series photographer. I work on single images more than anything. I grew up on Flickr, with other fine art photographers who tend to work that way and they rubbed off on me. So focusing on one project for a full year was a challenge. To think of an idea that meant so much to me that I would be able to continue with it was a challenge. Everything with this was a challenge. Living in NH, shooting during the winter when I need to strip down to nothing... difficult. Fortunately I was able to travel and three out of six of my final images were photographed in Oregon in locations I could only dream of. This series would not be possible without the support of friends like Nick Johnson and Meagan Abell, or the human tripod skills of Sarah Ann Loreth, Kindra Timmerwilke, and Rob Woodcox. To everyone who has given me criticism and aid, thank you. This was one of the most nerve wracking photo experiences ever, but I am proud of what I have now. So thank you.